The previous chapter opened with whom to avoid as a seeker; whereas, this chapter tells us which friendships we should cultivate. The basic advice is to value friends who teach us in what ways we could become wiser. A true spiritual friend to a walker of the path is one who will challenge us to be better, wiser. Furthermore, the early lines of this chapter stand in contrast to the final lines of the last chapter. We shouldn’t cultivate relationships with fawning or subservient subordinates; rather, we should associate with ego-challenging equals or superiors. This is the path of wisdom. The tamer of mind doesn’t seek out (previous chapter) nor does she react to praise or blame. These are concerns that center on self and reputation. They are part of the engine of samsara. On the contrary, the sage seeks friends who assist in the task of cultivating wisdom. Again, as I discussed briefly in the last commentary, this fits well with Aristotle’s analysis of friendship. For him, true friends act as companions in developing our excellent qualities, our virtues, through practice and effort. These qualities are something developed over time through repetitive action, and that also makes his understanding of taming character similar to Buddhism. If interested in exploring further, see my discussion of his ideas of friendship here. And completely liberated in this life. The Factors of Awakening are mindfulness, investigation of dharmas, effort, joy, tranquility, concentration, and equanimity. The personal cultivation of these factors was considered important in the spiritual practice by the Buddha. “Toxins” translates āsava, which is sometimes rendered as “effluents,” “intoxicants,” or “cankers.” It seems that the word originally meant both the intoxicating juice of a plant and the discharge from a sore. In the psychological meaning used in a Buddhist texts, it usually refers to the craving for sensuality, becoming or existence, views, and ignorance. “Having destroyed the āsavas” is the most common description of an arahant, a fully liberated person. May this help you choose excellent friendships that establish your best qualities in cultivating wisdom. *The Tao Te Ching has similar comments about how the sage is not moved by praise or blame. This chapter is often translated as “Twins” or something similar due to the structural format of presenting an unskillful and then skillful way of life, one by one. These comparisons are twinned together. I really like Fronsdal’s translation of the title as “Dichotomies” though, as it highlights that these aren’t twins in the sense of being identical; rather, they are paired opposites. The other structural note for this chapter is that the matters of investigation for the dichotomies are indicated indirectly in the final lines: “passion, ill will, and delusion”. Interestingly, these could be a different way to say the three poisons that drive samsara: desire, aversion, and ignorance. As such, the twinned verses give us skillful means, intentions, and wisdom to address these three poisons. The tone of the chapter is of vigilance and effort. This chapter is revealing what actions should be taken in order to cultivate yourself and cleanse your mind. This is no easy task. This first chapter always reminds me of Epictetus’ talks on Stoicism in which he clarifies that we have it within our power to manage our judgments — our interpretations and evaluations of the world we’re in and the events that happen within it. This is our chance for freedom even in the face of the most painful and challenging situations: we control how we comport ourselves and how we judge what happens. Even in Stoicism, as here in early Buddhism, this is very difficult, and this is precisely what the Buddha advises us to do as well: control our view of the world, our actions towards it, and our speech. In so doing, wholesome results follow. First, it’s laudable that Fronsdal translates this as “experience”, rather than actions, deeds, or something else. This translation emphasizes that mind is a constructive event happening within us — not only what we do but also what we perceive, feel, and interpret are all a construction of mind. Not only does this fit with the already discussed matters in Stoicism, but it also fits with cognitive psychology and hermeneutics as well. In cognitive psychology, our beliefs and values are a key part of how we take in and experience the world. In hermeneutics, the philosophy of what it is to understand, Heidegger is famous for having said in Being and Time: “All understanding is interpretation.” Likewise, here, our experience of the world is based on our mind’s view of it. Furthermore, beyond experience, we have an emphasis on action and the results that come from it, this is karma. Karma means “action” in Sanskrit, and here we see that a peaceful view leads to skillful actions and happy results. The lesson is to cultivate those skillful actions and that positive view. This is a very simple formulation of how karma works in our lives to lead to better ones. This falls in with cognitive-behavioral therapy’s approach to shaping new behaviors through habit, and furthermore with findings regarding the neuroplastic brain changes made through repeated action. In other words, if we take the Buddha’s words to heart here and try to act with a peaceful mind (or at least act as one with a peaceful mind would), our way of being in the world grows and changes, changing ourselves, our view of the world, and our experience of it. Again, Fronsdal’s translation helps here by emphasizing “non-hate” rather than love, loving-kindness, etc. The Pali has a negation of hate, not a noun that means the opposite. This tells us something. To cultivate the new view, we need to let go of the values that fuel the old: the poison of hatred. Only then, can we generate loving-kindness. Also, here we see that cognitive reframing of our beliefs about our life, the world, and our place in it requires seeing that we are impermanent and acting from that wisdom. This is arguably more than just a logical shift of rationale. It’s deeper — a holistic experience, emotional as well as logical, that we are mortal, one that grasps it in our very bones without covering it over. To return to the structural note, this passage is a teaching on implementing the right view and action in regards to aversion — i.e. hatred, or as it is in the final lines, “ill will”. Other twinned verses speak about how unskillful relationship with desire leads to sloth and temptation into ongoing samsara and how improper understanding, i.e. delusion or ignorance, leads to valuing the wrong things in life. These final lines show us that the experience of the peaceful mind is exemplified in the following: abandonment of the three poisons (passion, ill will, and delusion), cultivation of awareness, and liberation of mind. We’ve seen these throughout this chapter, but the key element that has not directly been stated up to this point but is crucial for the path of the Dharma is that of not clinging. What makes the poisons so destructive is that we cling to the way we want the world to be rather than being at peace with what it is. This is the core of the shift of view that we need to deeply experience in order to truly cultivate everything that is discussed in this opening chapter. Wisdom is said to be the key virtue in Buddhism beyond the others, and the insightful wisdom that allows us to accept and not cling is the necessary piece for us to achieve the benefits here. However, even without it, there is much to gain, and we can inch closer towards that wisdom by taking up the wholesome actions and speech of a peaceful mind, even if we haven’t realized wisdom just yet. The change of the Dharma can be approached from both directions: from the direction of practicing skillful action and from the direction of seeing things with deeper wisdom. May this discussion of the Dhammapada lead you to a deeper engagement with wisdom and skillful action. 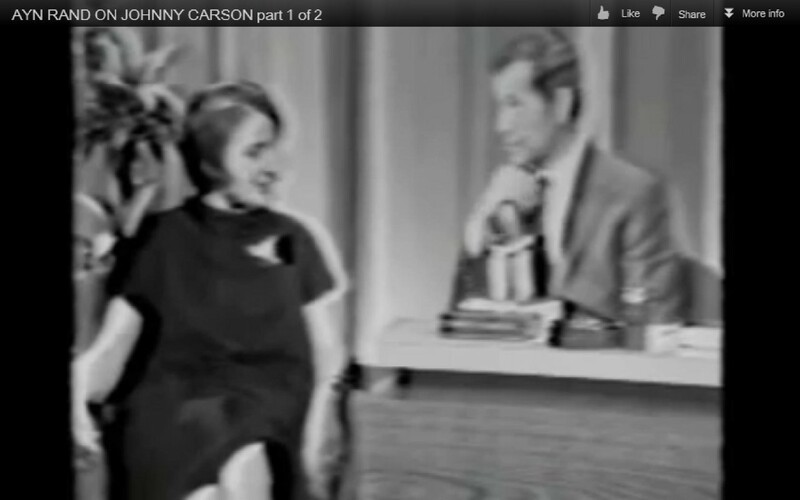 Ayn Rand on Johnny Carson??? To profound analyses of eudaemonia? What other response is fitting? What of the “Reason” of the Stoics? Would they not scoff as well? The immature are their own enemies, doing selfish deeds which will bring them sorrow. That deed is selfish which brings remorse and suffering in its wake. But good is that deed which brings no remorse, only happiness in its wake. Sweet are selfish deeds to the immature until they see the results; when they see the results, they suffer. Even if they fast month after month, eating with only the tip of a blade of grass, they are not worth a sixteenth part of one who truly understands dharma. As fresh milk needs time to curdle, a selfish deed takes time to bring sorrow in its wake. Like fire smoldering under the ashes, slowly does it burn the immature. Even if they pick up a little knowledge, the immature misuse it and break their heads instead of benefitting from it. The immature go after false prestige – precedence of fellow monks, power in the monasteries, and praise from all. “Listen, monks and householders, I can do this; I can do that. I am right and you are wrong.” Thus their pride and passion increase. May this bring you to think differently about yourself and your place in society and the universe. May it bring you to desire authentic wisdom and reason. May it inspire you to the love of wisdom (philosophy) and lead you down the path of many questions and insights. In recent weeks, I’ve received aspersions to my character, questioning of my intelligence, and other undeserved negativity. I’m a radiant, awesome, deep, heartfelt, kind, and insightful being, always pushing myself to improve, learn, love, and grow. I’m working through all this and trying to move beyond, despite all the loss that circles through my life. I’m grateful for seeing that we all are lost from time to time but that the way out is to admit it and work through with humility and vulnerability, to reach out to any involved and those you hold dear. Self-righteous proclamations and stubborn intention just continue a lost path. I feel the call here of Socrates saying that he is wise for knowing that he knows nothing – question what you know. Don’t assert it. Being reminded of this is one of the greatest lessons. I’m grateful for friends and being reminded that they are those who challenge you to be virtuous, i.e. live up to your excellence (à la Aristotle). They are willing to point out the things about yourself that you aren’t willing to hear and love you in spite of yourself sometimes (as we all sometimes struggle and act poorly). They do so much more than just support you. They are partners in your life’s changes. As such, they keep you honest and authentic to yourself and your path. If you are not open to their criticism, your friendship is not as empowering and vibrant as it could be. I’m grateful to be reminded that you should not make decisions out of fear and pain. Even when life throws you hard challenges, choose from a place of love, hope, faith, and intention for what you want to work toward. Do not choose from a place of fear, desire to numb pain, and what you want to run away from. Choose hope, not despair. I’m grateful for all the self-care routines I have developed over the years. Loving others and the world starts with taking care of yourself. I’m grateful for my personal strength. It’s amazing what you can make it through if you’re willing to face it. I’m grateful for my health, my heart, and my short time in this mysterious and beautiful existence. It’s really difficult to affirm our lives at times, given the struggles we undergo. It’s so easy to want to escape it all, but in the end, I choose to stand tall and proud, and like Sisyphus, I aim to affirm my lot and love my fate.